Employing a solid, strategic social media marketing plan for your roofing company is a great way to reach the millions of users who tap into social media on a daily basis. 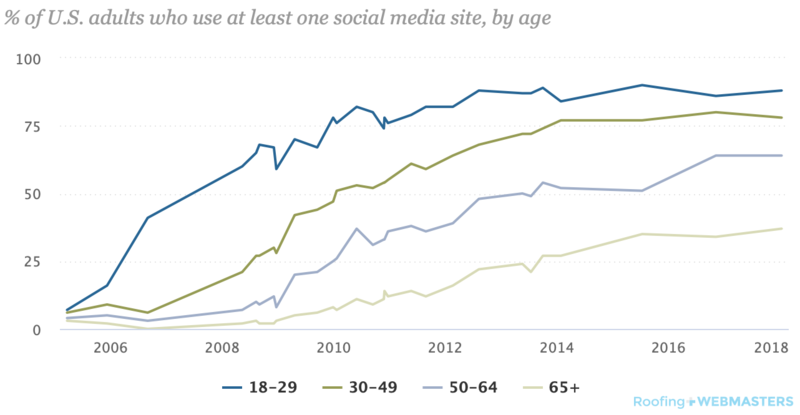 According to Pew Research Center, over 64% of U.S. adults aged 18-64 are on at least one social media platform, including Instagram, with greater use amongst the younger cohorts. There are many platforms to choose from, and new ones emerge or morph seemingly all the time, but focusing in on maximizing your presence on the social media sites/networks you choose to leverage for new roofing business will help your overall SEO strategy get a boost. Today we’re going to focus in on one social media platform — Instagram — to learn more about how to show up well for Followers and launch Instagram Sponsored Posts that actually encourage quality roofing repair leads for your company! How Does The Instagram Algorithm Work In 2019? There is always speculation and experts who will claim to know exactly how to best a given algorithm — be it Google, Facebook, or Instagram — but the most prudent advice is to listen to what the Big Wigs are saying. For example, when Mark Zuckerberg announced in early 2018 that Facebook was focusing on “meaningful social interactions,” as he worded it, it makes sense to think about how you, as a business, can tailor Facebook Ads and posts to align with this direction and intent. Don’t try to “beat it,” but understand that there are better approaches than others to perform well on a given platform, so start with an open mind as you optimize social media marketing. When it comes to Instagram marketing, it shouldn’t be a surprise that the best practices dovetail with the direction Zuckerberg shared for Facebook, given that Facebook owns IG. The goal of the social media leaders is to encourage engagement, to keep social media social. So tough love moment: if you show up on Instagram just to “sell,” you’re missing the point. If you take nothing else away from this article, remember—ENGAGEMENT. In the world of Instagram, this means comments, Direct Messages, and utilizing features like Questions and Polls in your Stories. We’ll get into more detail on some of these shortly with specific tips for working the Instagram algorithm for roofing SEO, but don’t forget that it’s the active actions that will boost visibility; not passive actions, such as mere likes and views. One of the most important aspects of performing well on social media as a roofing business is to change with the times. This can be tough to stay on top of, admittedly, which is why this is often an area that roofers delegate to a social media management team. Nevertheless, you want to know that what you’re putting out there (even on your behalf) is fruitful and relevant. So let’s look at how that’s done. Stories tend to get more play these days, and Facebook even introduced this feature into their platform given the warm reception. This is a fantastic way to set your roofing company apart from the rest and to show up in a unique way to potential customers. Share some behind-the-scenes looks at roof repairs (don’t forget to hashtag those roofing keywords! #roofrepair), spotlight your awesome team with some quick interviews focused on fun questions (like favorite foods, TV shows, or most beloved thing about your city), and share your posts on Stories too. Remember: users may interact with Stories but miss your post on their feed, so show up on both to maximize access to your great content. A Forbes article about Instagram Marketing gave sage advice: “Post often and proactively engage with your audience.” Not only are you shooting for quantity (frequent posts), but quality matters too. If you plan to foster relationships with followers — or even try to reach those who don’t already follow you via sponsored posts — you’d better think about what they want to see from you, and deliver that. This seems obvious, but try to put on your Content Marketing hat and make sure you’re focused on increasing your relevancy and authority by serving Instagram users with awesome content related to what you do. No one expects you to start posting fabulous #ootd photos (although that could be awesome and earn some legit attention), so create content about roofing that is germane to your service area, but also serves a broader audience than your existing client base. The point of any marketing is to increase your brand awareness and (hopefully) increase sales, but lead with industry expertise to establish yourself as an authority in the roofing services realm. Follow with a desire to deliver content that is helpful beyond an explicit CTA (“call to action”), such as warning signs that [your] roof might be damaged after a hailstorm. Notice that this topic is extremely specific. This is intentional, as it opens up the door for a ton of “drill down” topics within the overarching theme of roofing repairs and installations. But it also allows you to uniquely speak to users who may need that content. I shared earlier that active engagements, such as comments and DMs, are the name of the game to perform well with the current Instagram algorithm. To keep this from becoming forced or painful, approach Instagram as an online community with a huge potential for an invaluable referral network. Think about it: Followers essentially allow you to market to them regularly. This is amazing! And while the focus isn’t just on gaining new followers — although that will likely follow as you offer must-see content and interact with other users and brands — it’s a great mindset to anchor your social media strategy. While you don’t need to do it with every single post (that could get annoying), be sure to invite Followers to comment on posts via the captions you write for a given image. It doesn’t have to be explicitly related to roofing, as you may get more responses by asking users to share their worst home repair experience or best moment in their current home. These are still relevant to the services you provide (as a home repair expert), but they are broadening the scope for discussion to invite responses and increase engagement. Stories, as previously discussed, are a really fun, authentic way to capture the attention of Instagram users. You can include stickers and text to increase your appeal, including the Questions function, which allows you to pose a question and collect responses. You can share these responses after the fact, or simply use this as a launching point to interact with respondents via Direct Message. Tell me your favorite neighborhood in town to house hunt! What is your biggest concern when hiring a home repair professional? What was the biggest factor when choosing a new roof for your home? 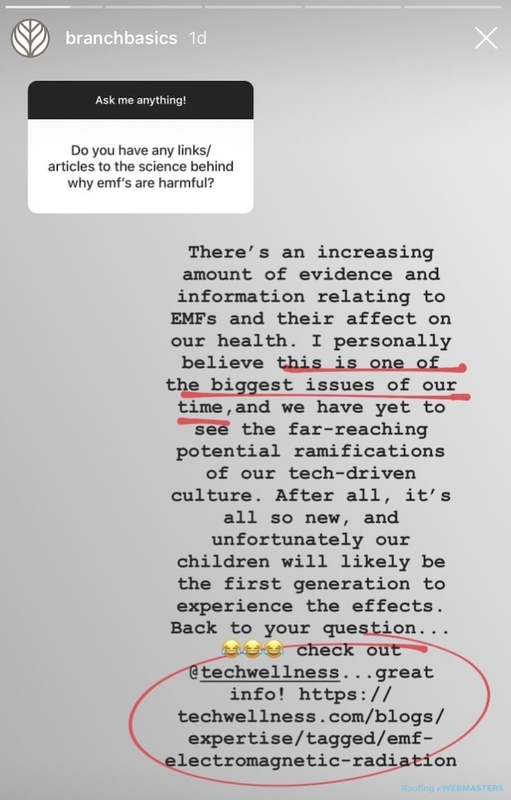 If I recall correctly, I’ve seen the “magic threshold” as less than 4 hour response time to demonstrate good engagement with Instagram users who send Direct Messages (“DMs”), which are basically private messages sent within the app. However, the goal should be reasonable and helpful. If you can set up notifications to let you (or whoever is managing your social media marketing) know when there is a new DM, this will increase the likelihood you can respond in a reasonable time frame. It’s not uncommon for faithful Instagram users — noting that 60% of these folks check in daily with the app according to Pew — to utilize this platform for as much of their communication as possible, which means that email and phone may not be the only methods by which you can be reached (assuming you want your share of their business). And while comments may not be as time-sensitive in terms of responsiveness, you should still encourage ongoing engagement by at the very least liking the comments on your posts. But ideally, you comment back via the reply function, which also demonstrates to other followers that you’re truly plugged in and have a desire to cultivate relationships. This goes a long way and will help keep your content in view for more and more users. 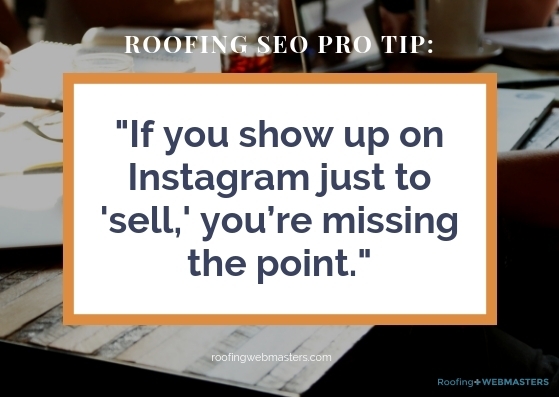 At the end of the day, you don’t have to employ every tip and trick out there to leverage the Instagram algorithm to boost your roofing SEO. But if you focus on treating this platform and the users on it as legitimate lead opportunities, then you’re far more inclined to optimize well and reap the benefits of this robust network.